I never did discover just how much fun math can be until I had kids of my own. It’s not just a pile of worksheets after all! I try to support my girls’ math learning at home all the time. And, when it comes to math practice at home, I’ve got one criteria – it has to be fun! 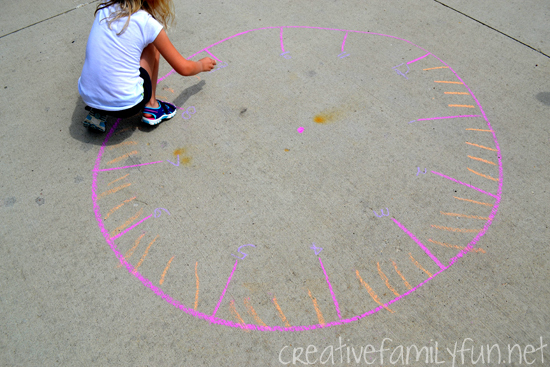 So we grabbed out sidewalk chalk and went outside to practice math with a fun outdoor clock game. 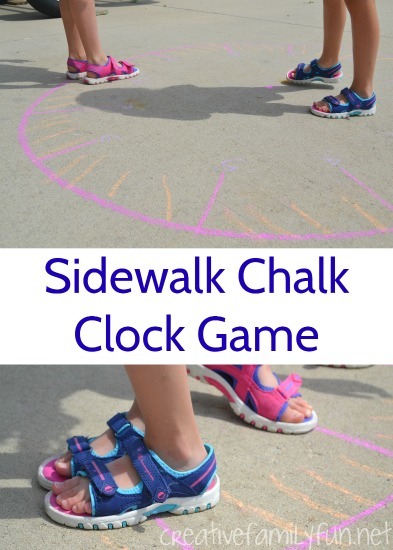 This Sidewalk Chalk Clock Game is a fun way to get outside, get moving, and practice math. Can math practice be anymore fun? 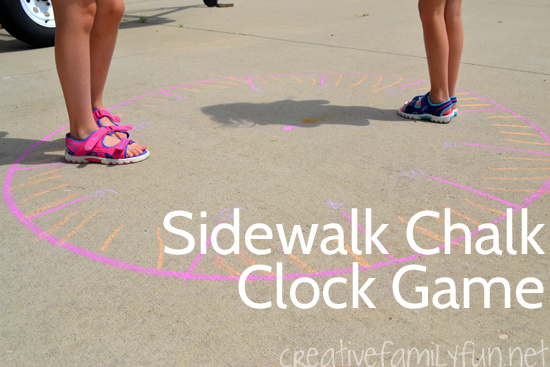 Before we began the game, we drew a big clock on our driveway with sidewalk chalk. Your kids will need to move around the clock and use their bodies as the clock hands, so you need to make a large clock. I drew the circle and the marks for each hour. I had the girls fill in the numbers for the hours and the extra lines in between each. It truly was a collaborative effort. The game works best with two people. One person is the hour hand and the other person is the minute hand. Since my girls are at two different levels in math, I had my youngest daughter (1st grade) be the hour hand and my older daughter (3rd grade) be the minute hand. Once we were ready, I called out a time. The girls had to stand on the correct location. For instance, If I said “1:30,” one child would stand on the 1 and the other child would stand on the 6. In order to challenge my oldest, I would call out harder times like 3:56, 5:18, and 12:23. Keep with whatever level your child is at. If you are playing with only one child, get in and play the game with them! Or, use rocks for one or both of the hands. One rock for the hour hand and one rock for the minute hand. Instead of standing in the correct locations, place the rocks in the correct location. 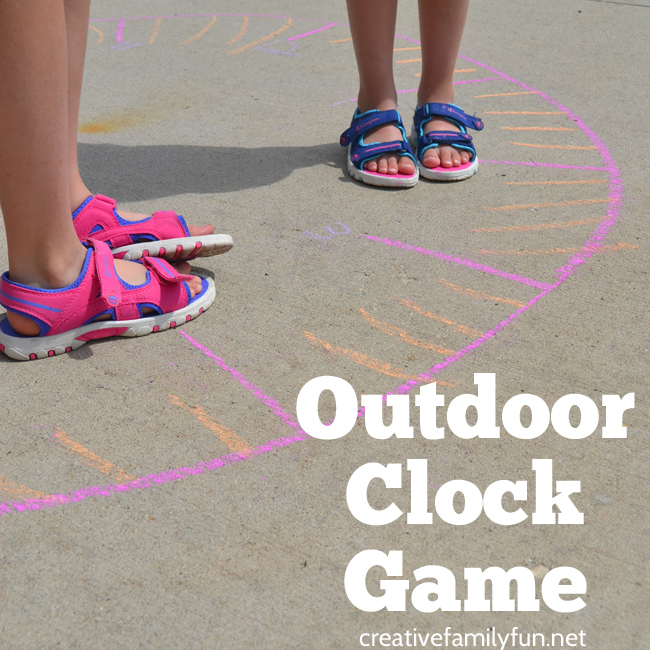 This outdoor clock game is tons of fun and can be easily adapted for any level. My girls always love to take their learning outside – and who can blame them? 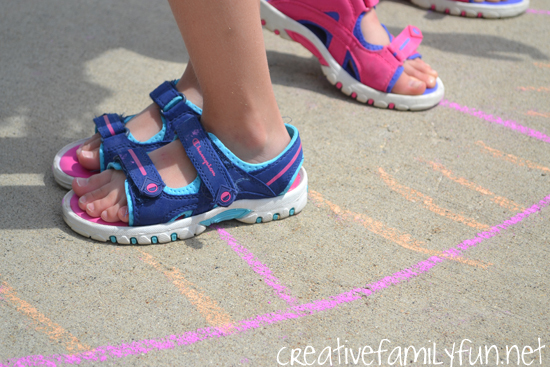 Draw a clock on the driveway and you’ll have tons of learning fun, at least until the next time it rains!